We have come here today to accompany Jesus on his journey of sorrow and love, the Way of the Cross, which is one of the most intense moments of World Youth Day. At the end of the Holy Year of Redemption, Blessed John Paul II chose to entrust the Cross to you, young people, asking you “to carry it throughout the world as a symbol of Christ’s love for humanity, and announce to everyone that only in the death and resurrection of Christ can we find salvation and redemption” (Address to Young People, 22 April 1984). Since then, the World Youth Day Cross has traveled to every continent and through a variety of human situations. It is, as it were, almost “steeped” in the life experiences of the countless young people who have seen it and carried it. No one can approach and touch the Cross of Jesus without leaving something of himself or herself there, and without bringing something of the Cross of Jesus into his or her own life. I have three questions that I hope will echo in your hearts this evening as you walk beside Jesus: What have you left on the Cross, dear young people of Brazil, during these two years that it has been crisscrossing your great country? What has the Cross of Jesus left for you, in each one of you? Finally, what does this Cross teach us? 1. According to an ancient Roman tradition, while fleeing the city during the persecutions of Nero, Saint Peter saw Jesus who was traveling in the opposite direction, that is, toward the city, and asked him in amazement: “Lord, where are you going?” Jesus’ response was: “I am going to Rome to be crucified again.” At that moment, Peter understood that he had to follow the Lord with courage, to the very end. But he also realized that he would never be alone on the journey; Jesus, who had loved him even unto death on the Cross, would always be with him. Jesus, with his Cross, walks with us and takes upon himself our fears, our problems, and our sufferings, even those which are deepest and most painful. With the Cross, Jesus unites himself to the silence of the victims of violence, those who can no longer cry out, especially the innocent and the defenseless; with the Cross, he is united to families in trouble, those who mourn the loss of their children, or who suffer when they see them fall victim to false paradises, such as that offered by drugs. On the Cross, Jesus is united with every person who suffers from hunger in a world where tons of food are thrown out each day; on the Cross, Jesus is united with those who are persecuted for their religion, for their beliefs or simply for the color of their skin; on the Cross, Jesus is united with so many young people who have lost faith in political institutions, because they see in them only selfishness and corruption; he unites himself with those young people who have lost faith in the Church, or even in God because of the counter-witness of Christians and ministers of the Gospel. The Cross of Christ bears the suffering and the sin of mankind, including our own. Jesus accepts all this with open arms, bearing on his shoulders our crosses and saying to us: “Have courage! 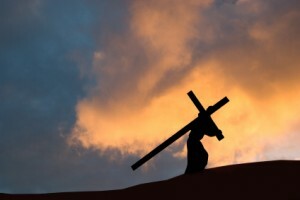 You do not carry your cross alone! I carry it with you. I have overcome death and I have come to give you hope, to give you life” (cf. Jn 3:16). Next Article Reincarnated or Redeemed?